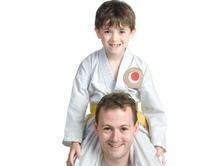 Our Junior Tigers program is designed for children 5 - 9 years of age, perfect for the beginner level. It focuses on respect, discipline, and self-confidence through the martial arts to build on these essential life skills, better preparing them for success later in life. Because we understand the value of your time, we offer variety & flexibility in all our programs that makes it convenient for our members. Our Advanced Tigers program is specially designed for children 7 - 9 years of age with intermediate to advanced experience. It focuses on sharpening their skills both mentally and physically, while preparing them for the more advanced programs. 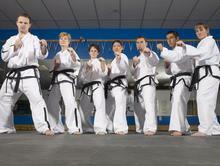 Our Tae Kwon Do program is suitable for the beginner level ages 8 and older. Emphasizing the core values of martial arts such as respect, discipline, and self-confidence students learn the fundamentals of an Olympic sport as well as practical self defense skills. 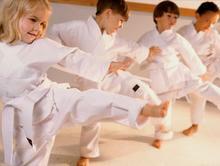 Our Tae Kwon Do advanced program is designed for those with intermediate to advanced experience that are 8 years of age or older. Incorporating the Olympic sport aspect of Tae Kwon Do as well as practical self defense skills from many different styles of martial arts, it's an ideal mix of Tae Kwon Do, Hap Ki Do, Judo, Kickboxing, Jiu Jit Su and much more. Our Family Classes provide a great environment for both children and adults ages 8 and older no matter what your experience level is. Whether you're a beginner, intermediate, or advanced student, you'll get the great workout and fun family experience everyone is looking for when they join a martial arts family program. Our Kickboxing program is a great mix of Tae Kwon Do, Kickboxing, and cardio kickboxing thats ideal for those looking for a program that incorporates both the fitness aspect as well as the practical self defense applications of the martial arts. "There's no price tag on quality instruction, it's only worth what you make of it." 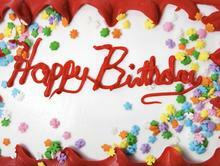 Our Martial Arts birthday parties are always a sure thing. Packed with martial arts themed games such as Ninja Dodge Ball, Mega Kick Ball, Ultimate Samurai Sword Fighter, and much more, your childs party is sure to be the talk of the town. With plenty of room to run around and tables and chairs provided, you can turn our studio into whatever your childs imagination can come up with. "A willingness to give respect today can earn you a lifetime of success tomorrow." "Everyone wants to succeed, but a few go the extra mile to go beyond."